Museveni holds the newborn named after him. The baby has since passed on. Courtesy photo. IGANGA–The newly-elected Iganga Woman Member of Parliament, Brenda Suubi Asinde, has lost her newly born baby named after President Yoweri Museveni. The two weeks old baby Swabulu Sebukaire Kaguta died this morning shortly after being admitted at Rubaga hospital in Kampala. According to her husband Abdurahuman Sebukaire, the infant never had any medical complication until around 3.30 am this morning when he started feeling unwell. “We rushed him to Rubaga hospital and we were shocked to be informed by one of the nurses that he had passed on upon being admitted to the intensive care unit,” he said. The deceased had been named Kaguta because he was born shortly after her mother Asinde had just paid a visit to President Museveni at State House during campaign time. Asinde thereafter gave birth to the boy and surprised all and sundry when she addressed a campaign rally just three hours after giving birth at Iganga main hospital. Meanwhile, hundreds of mourners were by press time gathered at the home of the legislator in Busei village, Nakalama sub-county awaiting the arrival of the body from Kampala. 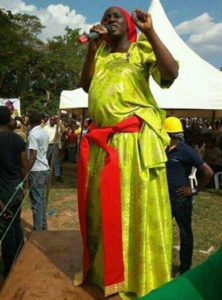 A visibly pregnant Brenda Asinde aka Maama Maadi woos voters during one of her rallies. PML Daily. Mohamed Ziruntusa, Asinde’s chief campaign manager, expressed shock upon the death of Kaguta. “ I am short of words because we were just preparing to celebrate our candidate’s victory when the sad news broke that our beloved son has died,” he said. Baby Kaguta came to the lime light recently when he was carried by President Museveni in a campaign tour to canvass support for Asinde at Nakigo Primary School playgrounds amidst cheers from supporters. Some supporters claimed this was a sign of fortune since the baby had been carried by the President at such an early age. One of the staunch supporters of Asinde, Jamila Kagoya of Busei village could not hide her tears upon receiving the news that baby Kaguta had passed on. Iganga district vice chairman Michael Kibwika said it was unfortunate that the legislator had lost his beloved son just moments after winning the tightly contested elections. Kibwika urged Asinde to stay firm and pray to God during the hard times of loosing a loved one.